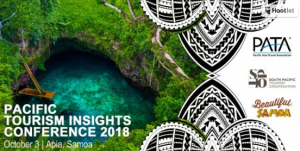 Apia (Samoa) – August 8, 2018 (travelindex.com) – The Pacific Asia Travel Association (PATA) in partnership with the South Pacific Tourism Organisation (SPTO) will organise the second Pacific Tourism Insights Conference (PTIC) in Apia, Samoa on October 3, 2018. The event, generously hosted by the Samoa Tourism Authority (STA), brings together a dynamic and unique line up of international thought leaders recognised for their success and expertise in innovative and disruptive thinking. Key topics to be analysed and discussed during this insightful event will contribute towards achieving the objectives of the Pacific Tourism Strategy 2015-2019, which provides the strategic framework to support the development of tourism in the Pacific. The registration fee is US$100 and complimentary for local delegates and students. A 50% discount is available for PATA and SPTO members. For the promotional code, please email pacific@PATA.org. For more information or to register for the event, please visit www.PATA.org/PTIC.